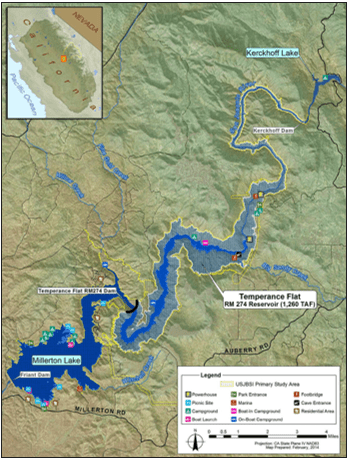 Long-awaited findings from the U.S. Bureau of Reclamation show that any alternative for developing the proposed Temperance Flat Reservoir in upper Millerton Lake are feasible, with what appear to be good cost-benefit ratios despite the project’s high cost. Reclamation officials say Temperance Flat would improve water supply reliability and flexibility for the water management system for agricultural, urban and environmental uses with benefits that would be generated annually. It also would enhance San Joaquin River water temperature and flow conditions to support anadromous fish restoration efforts. However, a preliminary look at some aspects of the lengthy feasibility study that was released in late February is sparking some questions by the Friant Water Authority. Ronald D. Jacobsma, FWA General Manager, said that the Authority has just begun to take a hard look at the report’s details. “We’re pleased that the study has progressed to this point,” Jacobsma said. He added, “Friant believes a more extensive analysis is needed of additional project benefits with Delta integration. We believe there are other added benefits as well that should improve Friant water availability and reliability in addition to water supplies of other south-of-Delta contractors. Development of Temperance Flat Reservoir, which would have a capacity of some 1.33 million acre-feet behind a new dam about six miles upstream from Friant Dam, is the proposed storage facility that has emerged from a lengthy CalFed Bay-Delta Program process known as the Upper San Joaquin Storage Basin Investigation. Millerton Lake is the Friant Division’s primary storage facility but has a comparatively small storage capacity of 520,500 acre-feet that must be used to control average annual runoff of 1.8 million acre-feet. Temperance Flat Reservoir would be larger than Millerton Lake and all of the many existing upstream hydroelectric power reservoirs combined. The new lake has long been envisioned as a means of capturing high flows generated by above-average water years that otherwise are mostly “spilled” as flood releases because of a lack of Millerton Lake capacity and conveyance capacity constraints in the Friant-Kern and Madera canals. Those constraints limit Friant Division groundwater recharge and banking opportunities in above-average water conditions. A Temperance Flat project would cost about $2.5 billion but provide benefits from $95-$578 million. It could potentially provide water for both Central Valley Project and State Water Project users, according to the draft feasibility analysis.